Crochet washcloths are a joy to make. They are small so you can comfortably make them at any time of year, even when it's too hot to crochet much else. They use much less yarn than many projects, such as blankets, which offers a great opportunity to try new yarns and to use up scraps. Crochet washcloths can be super simple since they are easily made in basic crochet stitches and don't require any shaping. They can also be more complex if you're seeking to try new stitches and crochet techniques in a project. Since they work up quickly, crochet washcloths are a great instant gratification or last-minute-gift crochet project. This washcloth is so soft, yet the simple textured stitch is nice for scrubbing. That's true whether you're using it to scrub your body or a dirty dish; this is design for both bath washcloths and larger dishcloths for the kitchen. If you ever plan to give a gift of pretty soaps, lotions, shower gels or other body care products, the handmade washcloths would be a lovely addition to the gift package. If you're looking for an easy, beginner-friendly washcloth that's pretty but basic, this one is a good one to consider. It's a simple project that can be quite meditative and enjoyable. This lace washcloth features a fancy scalloped border that you could also crochet separately, adding it to pre-made towels to personalize them. The washcloth itself is fun to make, though, so you don't want to miss the chance to work on it. It has a unique combination of puff stitches and half double crochet v-stitches. This creates a terrific texture that is perfect for a washcloth and is also pretty when the cloth is just hanging in the bathroom awaiting use. Crochet a luxurious washcloth with this free pattern. The washcloth is soft and gentle enough to use on a baby, but people of any age will enjoy using it. It's crocheted with Nature's Choice organic cotton yarn by Lion Brand, which is a great choice for a crocheted washcloth. Most good crochet washcloth pattern will call for cotton yarn since it is the best choice for products that are going to get wet. Cotton doesn't stretch out so much in water and doesn't hold the water too much as wool does. This crochet washcloth is an easy pattern which incorporates two different variations of single crochet stitch. It is always neat to see the way that even the most basic stitches can look entirely different when worked in different manners, and this is a terrific example of that. This is a basic washcloth design worked in different colors for a totally different impact. Since you only need small amounts of each color, this version of the washcloth lends itself well to using up leftover yarn. Worked in the color shown, it's a great autumn design. Worked in red, white and green, it would be a terrific Christmas gift. 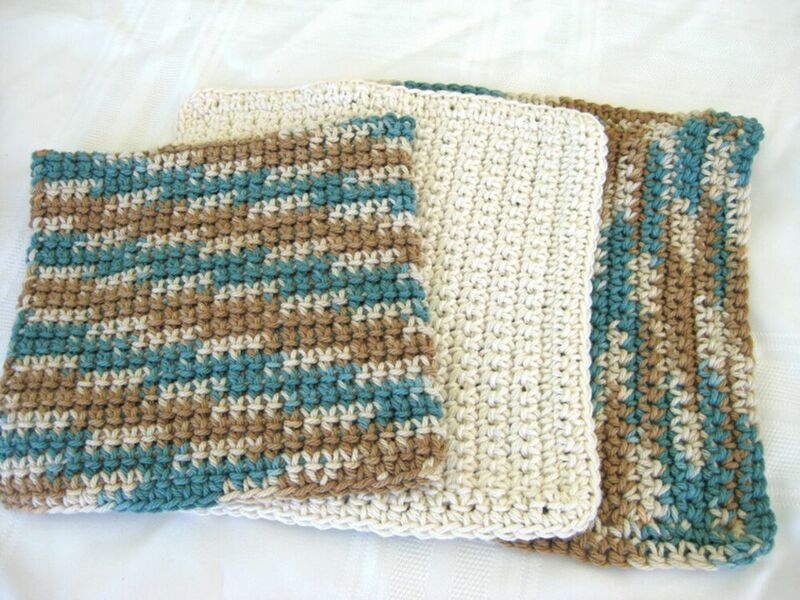 The previous two crochet washcloth patterns incorporated two different versions of single crochet stitch. Take that idea even further with this sampler washcloth that shows you how to work the sc stitch in five different ways! The variegated yarn gives you an all over color theme while the different stitches produce different textures, allowing you to see what types of stitches you like best when it comes to making your crochet washcloths.